La Noche de San Juan, or San Juan Night, is a fun festival celebrated throughout Spain commemorating the longest day of the year with roaring bonfires, lots to drink, good food, and great friends. 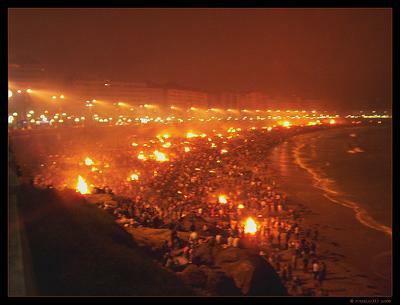 In Marbella and the Costa del Sol San Juan Night 2010 is celebrated on the beach, which makes the evening more special. This year the local town hall is organizing San Juan Night 2010 with two festivals in Marbella and San Pedro with performances from local artists including "Los Rebujitos" and Sergio Contreras. In Marbella the Youth Delegation and the Deputy Mayor of San Pedro are holding celebrations at Pinillo Beach in Marbella and San Pedro Beach starting on the eve of June 23. There will be a fun calendar of events organized by the local youth in order to make this night special. The band "Los Rebujitos" and Sergio Contreras will hold concerts at 10:30pm in Marbella and San Pedro. This year, students from the carpentry workshop school created a doll (Judah), which will be burned at midnight according to local tradition. La Noche de San Juan has grown significantly in Marbella and San Pedro. This year, 6,000 people are expected to attend the event. To read more about the tradition of San Juan Night, click here.